Bill Gerphardt was an investigative consumer television reporter for over 30 years where he was committed to telling only the truth to the consumers of Utah. Since then, nothing has changed! Starting Gerphardt Approved was his way of doing some digging on the local businesses of Utah, so you don’t have to. Gerphardt and his team look for the best of the best, the honest businesses, run by good people, so that you can hire someone knowing full well that you are getting what you paid for. 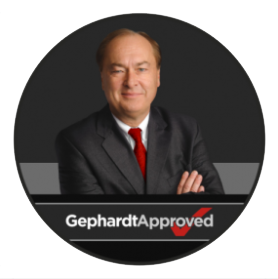 Being Gerphardt approved means that Bill personally recommends our business to the consumers of Utah. In fact, he has so much confidence in the businesses he approves that he promises a $1000 guarantee that you will be satisfied with our work. So, if you are at all unhappy with the services that you receive, Gerphardt will refund you with up to $1000 of what you paid. With that, you can proceed with 100% confidence knowing that one of the most trusted names in Utah business has given us his stamp of approval.